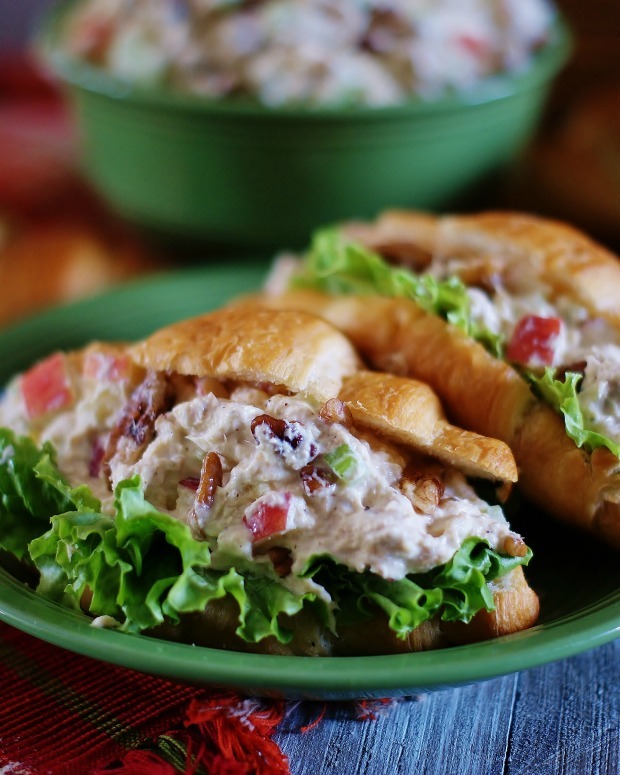 I grew up with my mom eating tomatoes stuffed with tuna salad during the summer. I would feel so grown up when she would cut open a tomato just for me and we would eat our summer salad together. It was her special low cal lunch with a Tab. It’s what ladies did. And I thought it was glorious. Over the years, though, a few things have changed. First, you’d be hard-pressed to find a Tab anywhere. And secondly, dieting… well, let’s just say it’s lost some of its grown up lady glamorous appeal. 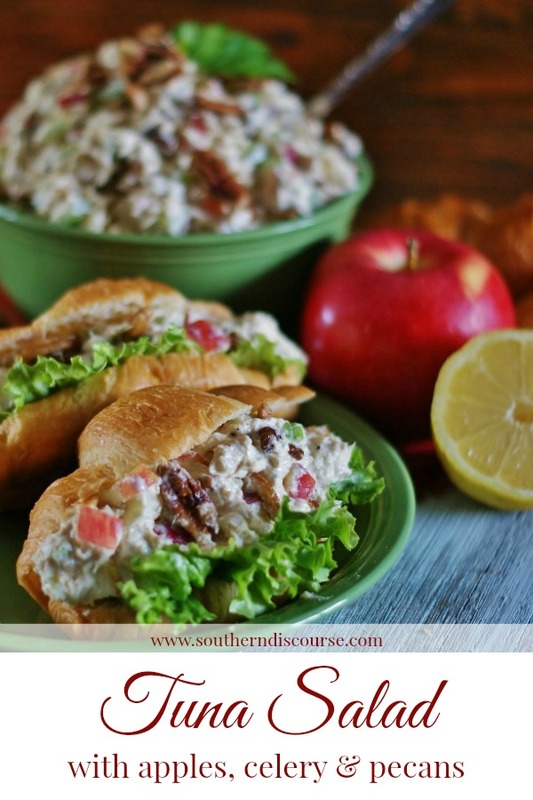 But one thing is for sure, tuna salad is still hands down one of my favorite go-tos for the perfect no-cook lunch or supper. Now, I don’t know how your mom made tuna, but my mom used a pretty traditional tuna salad recipe fraught with sweet pickles, onions, and boiled eggs. And I still love that recipe. But sometimes, I have to shake things up a little. And that’s when this little number comes in handy. 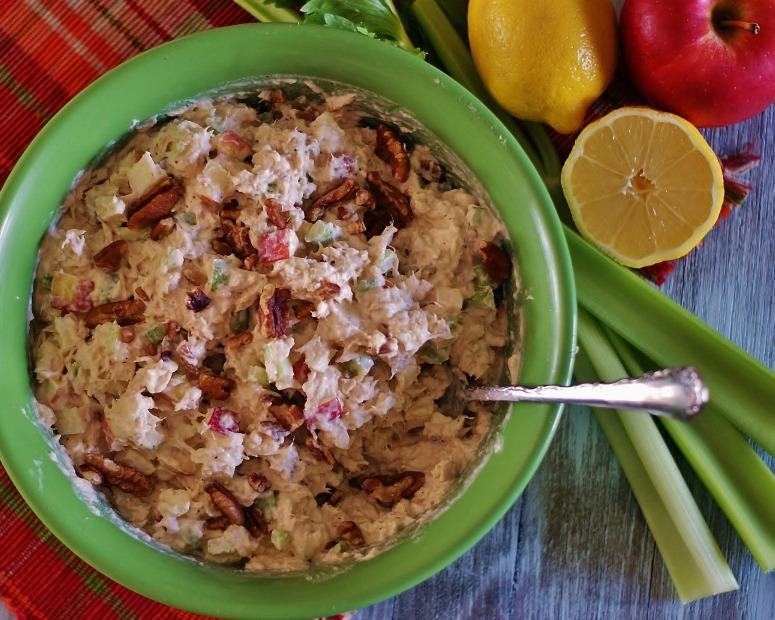 Chock-full of chopped apples, ribs of celery, and buttery southern pecans, this tuna salad makes an ever so subtle nod to a classic Waldorf. It’s perfect on a croissant or on a bed of lettuce with some lovely multi-grain or wheat crackers. Ladies who lunch, anyone? I don’t know about you, but I am crazy about some fruit, especially in the summer. So the fact that this recipe has apples in it definitely got my attention right away. And while I have made this the standard Red Delicious variety (and even some Granny Smiths), Honeycrisps and Gala are by far my favorites with just the right amount of sweet crunch to compliment the other flavors in salad. When I am chopping and dicing for this dish, it’s no wonder that I add more crisp apple than anything else. Just look at those colors! You know this is going to be good. A little mayonnaise, a splash of mustard, the juice of half a lemon, and a hefty sprinkling of cracked pepper, and you’re on the fast track for the perfect summer meal. Tip: Use a fork to mix this salad together. 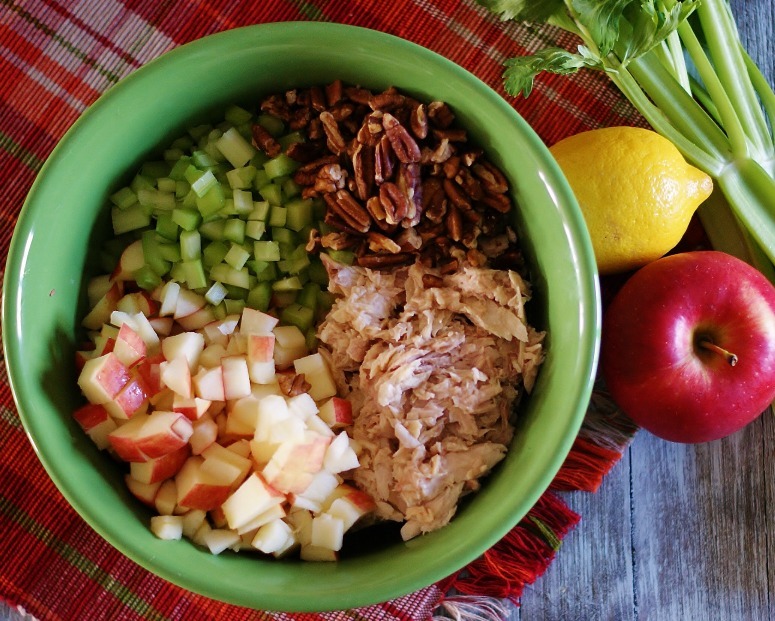 The tines are perfect for shredding the tuna and evenly mixing the chunks of apples, celery and pecans. Now this salad is yummy straight from the bowl with your mixing fork. Somebody has to taste test! But I find that it makes a great meal when served on buttery croissants or with crackers. Slice up some extra fruit or whip up a box of macaroni and cheese, and my kids will almost eat the whole bowl by themselves. And the great thing is this is a quick and easy meal they can make themselves while off at college or on the off chance they find themselves home alone. But it’s also a perfect girlfriend lunch, awesome at showers and backyard get-togethers, and just right when there’s no time to cook or for those quiet nights at home with The Engineer. 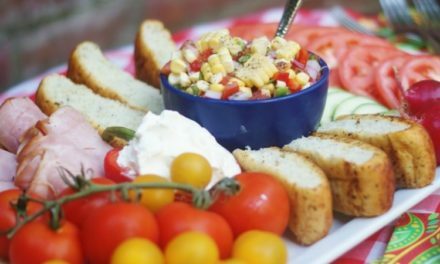 A few fun things you might need to serve this easy meal! 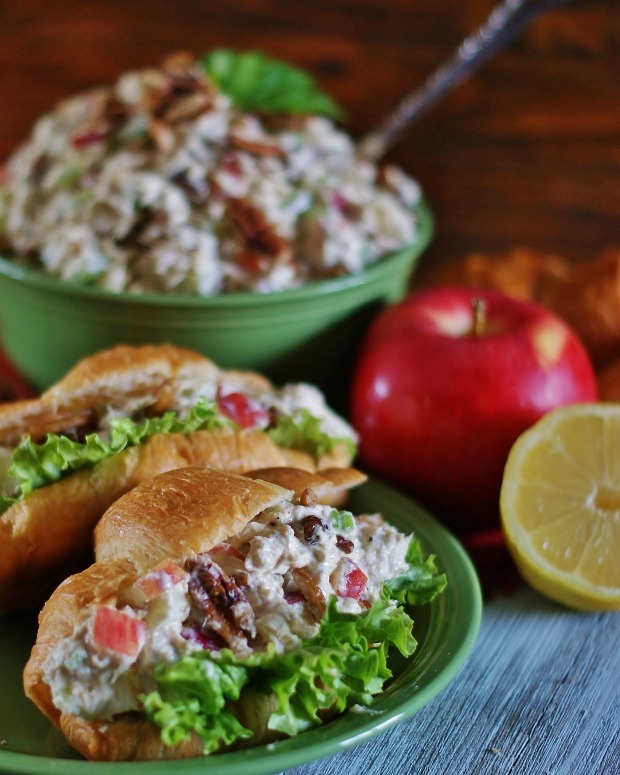 Mix together using a fork drained tuna, chopped apples, diced celery and halved pecans in a large mixing bowl. Add mayo, mustard, lemon juice and cracked pepper. Mix well, making sure all tuna is shredded. Serve on croissants or with crackers. 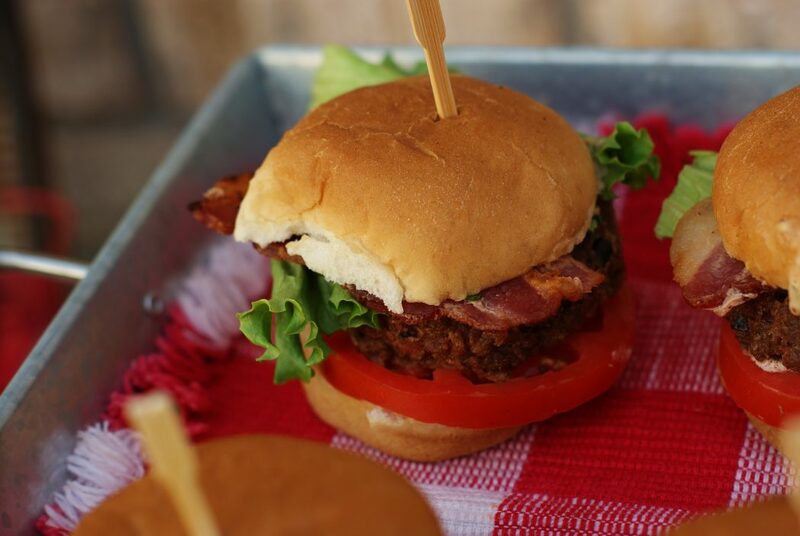 Check out this and other great recipes on Meal Plan Monday , Foodie Friday, & Weekend Potluck! What a delicious lunch! 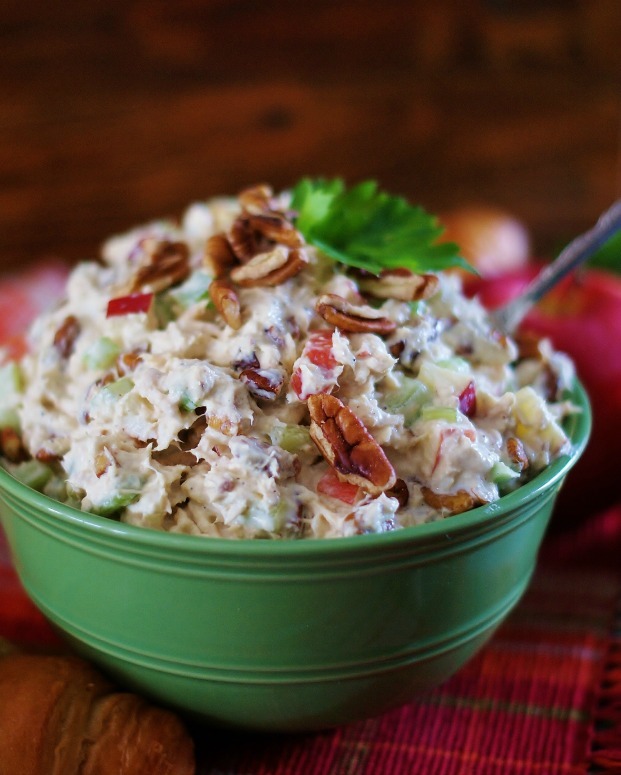 I never thought about putting apples in tuna salad, but it sounds wonderful. And I love the Bible verse! Thanks for sharing on Foodie Friday. Thanks, Julie! The apples are definitely my favorite part. The sweet crunch just does something so perfect! 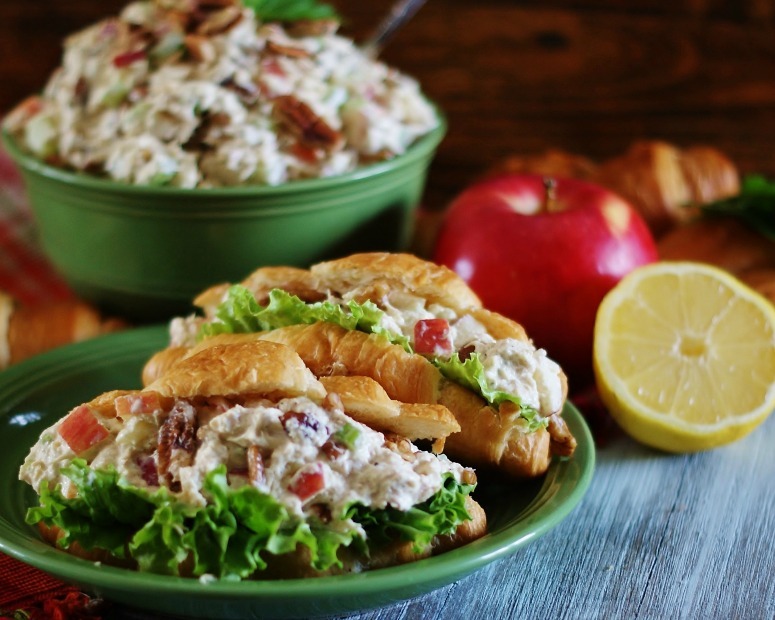 What a lovely twist on traditional tuna salad, so fresh and perfect for summer! 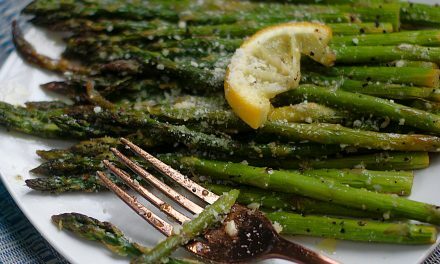 I love the wholesome ingredients too – this is healthier eating made delicious! I would love for you to share this post with the Hearth and Soul Link Party live on my blog now. I found your post via Miz Helen, and am so pleased to discover your blog! Welcome to A Southern Discourse, April! I just love Miz Helen an Full Plate Thursday. She is such a wonderful hostess every week. Would love to join you over at Hearth and Soul! Thank you so much for the invitation. You always have such lovely recipes and table settings ideas over there! I am eating this as we speak! YUM! 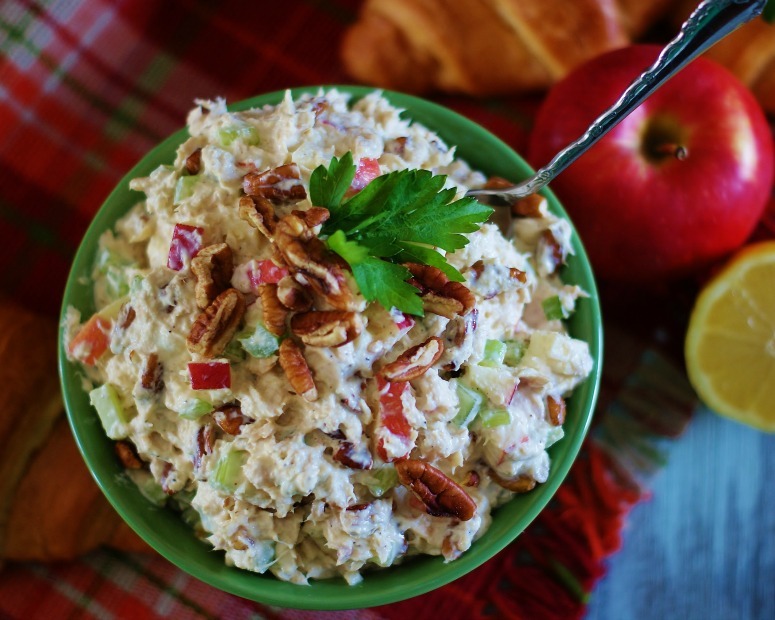 My mom has always added apples, black olives, pecans, and hard-boiled eggs to her tuna salad, but I like this version even better. (Shhh!) I did add hard-boiled eggs for extra protein, but kept everything else the same as yours – I love the celery, lemon juice, and mustard variation! Definitely going into my summer lunch rotation!! Yum!! So glad to hear this! Don’t you just love it?! The hubs doesn’t like eggs, but I would love the addition for myself. I wish I was eating it now that we’ve been talking about it! Ha! Oh my goodness, Miz Helen! Thank you so much! 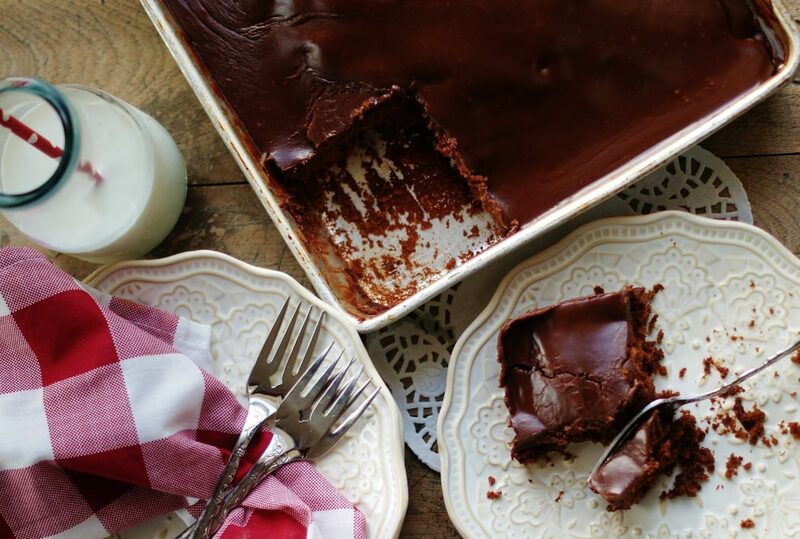 Full Plate Thursday is an awesome resource for some wonderful recipes and tablescapes. I am always thrilled to be included. And pins!! You know how I love them! Just found your blog! Love your new take on standard and classic recipes. what you cook and how you cook is the secret to still enjoying it. Thank you for sharing your changes. I’ll be back! Hi, Shelby! I am so glad we’ve connected, and I hope you become a regular around here! I couldn’t agree more about experimenting and keeping it new. That’s where all the excitement is! Of course, the classics are wonderful too. They’re what brought us to cooking and taught us to love it. I love honoring all those good food memories!